Republican Gov. Mary Fallin told members of the Oklahoma Legislature Monday that she wanted to see improvements in the state’s health, public safety and education systems. Preston Doerflinger, Fallin’s budget and finance secretary, said at a press conference the executive budget would include targeted spending increases: $25 million for common education, $16 million for the Department of Human Services, $20 million for the Oklahoma Health Care Authority, $5 million for the Department of Mental Health and Substance Abuse Services and $15 million for the Department of Corrections. Doerflinger said the governor’s budget would use about $300 million in state agency revolving funds to balance the budget, though he didn’t specify which agencies would have funds removed. Lawmakers also have access to more $500 million in the state’s Rainy Day fund About $120 million of the Rainy Day fund could be used for the budget, Doerflinger said. Gov. 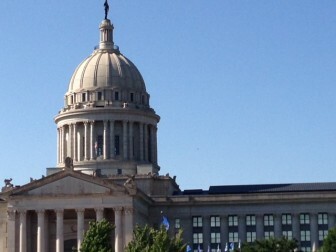 Mary Fallin’s spokesman said the state’s budget gap, currently about $300 million, is expected to “grow significantly,” which will be confirmed when the Oklahoma Tax Commission issues a revenue report today.